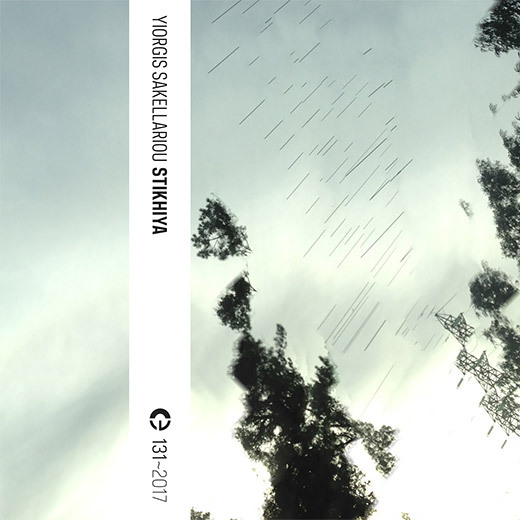 Greek composer Yiorgis Sakellariou creates deep listening electronic pieces in a dynamic musique concrete style. His first releases came in 2013. As of 2017, he has found a home on the excellent Crónica label, which released many of my favorite artists of recent years including @c. His 6th full length, “Stikhiya” is made up of two pieces, sides A and B, each roughly 18 minutes in length. It is a very limited edition of 100 copies, and a cassette only release. It is a subtle, dark soundscape with heavy use of field recordings / natural sounds, and a distinct absence of synthesizer. There are many permutations of rushing, billowing air, air forced through tubes and blowing through the leaves of trees. There is a general feeling of weatherbeaten desolation, as if all the sources of all these sounds were ruined debris from a deserted shell of a building, collapsed in on itself and rotted with rain. I can hear that it was recorded in a wet, cooler climate from the texture of the sounds. Cracks of thunder and heavy rain are clearly audible at several points. Yiorgis’ equipment is occasionally aimed at man-made creations as well, particularly heavy machinery. There are distinctly industrial touches: muffled clangs of distant metal objects, restlessly shifting pink noise, forceful blasts of compressed air mechanically released from pipes. These are woven in amongst natural sounds with a satisfying density and rapid pacing uncommon for avant garde music. The timbres are crystal clear and complex, leaving room for a world of emotional inference. The crisp vividness of the album is striking to the point of making it immediately likeable. The three dimensionality of the acoustic space is nothing short of amazing, likely the result of using handheld stereo recorders. Digital processing is kept largely to a mininum, transparent so as not to make itself too obvious, with the exception of a couple acoustically detached, purely electronic sounds, such as the noise as the end of side A. This entry was posted in News and tagged 131, Yiorgis Sakellariou. Bookmark the permalink. Comments are closed, but you can leave a trackback: Trackback URL.